In the spirit of getting the knitting and blogging plate "very, very clean" (as Colleen would say) in time for the Olympics to start on Friday, here's something I can move to the Finished Projects file! 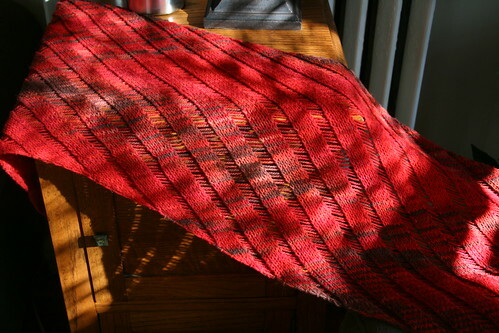 I actually finished Clapotis before Christmas, but didn't get around to blocking it until recently. (This didn't stop me from wearing it as a scarf in the interim, of course.) I'd like to go on record saying that Clapotis is like lace when it comes to finishing -- it looks good when it's done, but looks awesome once it's blocked. I love the Clapotis! Beautiful! Yay for the Knitting Olympics! I really love your Clapotis too. The yarn color is gorgeous. 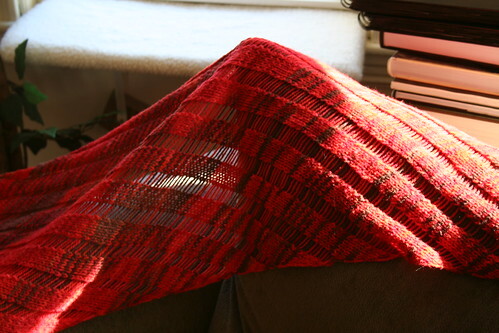 I loved the color the first time you showed it on the blog and now it's turned into the Clapotis and it's a wonderful fit for it!